Thread: Is the Mite V4 Hand Crankable For Emergency Starts? So many old school air cooled engines have provision for hand cranked emergency starting, and it got me to wondering if such a useful feature can be found on the MM V4. Surely the US military would have specified such an option, as the Mite's CJ3 forefathers did. So, is the V4 hand crankable? I don’t believe the Mite can be hand cranked. There are no provisions for it on the engine. The squirrel cage fan takes up a bulk of the space on the front of the engine. It’s a standard 24 volt M series layout. I’m sure you could add a slave receptacle to a Mite. I’ve never seen it done, but it’s possible that a field modification like that was created to start dead Mites. Last edited by ODFever; 07-28-2018 at 18:48. Last edited by nicholastanguma; 08-08-2018 at 06:11. I'm certainly not against the idea of adding a NATO-style slave receptacle, but having a hand crankable option would just be so, um, well so utilitarian that it's utterly cool. Kind of tacti-cool, admittedly, but nonetheless functional. We just put a tow bar on and pulled them! Here is a photo with a military added slaveport. Owner said he acquired it with a fuel fired heater, hardtop and found out it was used as an Arctic Test Vehicle. Thanks everyone for your insights into this topic. Especial thanks to you, ODFever, for your PM and all those close-up photographs from your Mite restoration project. At this point, after having studied every photo of and article about the Mite's AMC V4 that I can find, including photos and articles from way back in the 1960s, I've come to the conclusion that the engine simply cannot be set up for hand cranking. Because the squirrel cage fan is not directly affixed to the engine crank pulley, but rather is actuated by the engine crank pulley via a belt, it's just not structurally robust enough to handle the forces that would be put upon it by a hand crank. 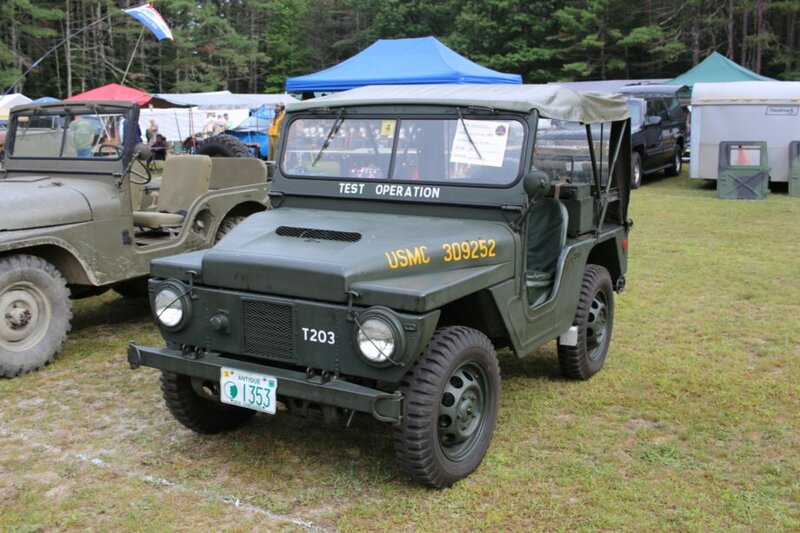 Ergo, I'm now of the opinion that in place of an emergency hand crank strategy any vehicle equipped with an AMC air cooled V4 should probably plan on an emergency bump start strategy instead--good thing the Mite is so lightweight! And in case anyone is wondering why I was so interested in this topic in the first place: I was wanting an air cooled, carbureted engine for placement into a small international overlanding truck, something as stone simple and field rebuildable as possible. The Volkswagen flat 4 is the most obvious choice in this field, obviously, and has indeed been a hand crankable design from its inception in the 1930s, but a VW boxer really needs dual carbs to make the kind of power I'd want my truck to have. Clearly an international overlanding rig will be making frequent elevation changes, and the thought of having to constantly rejet 2 separate carbs really annoyed me, therefore when I discovered the existence of the AMC V4 I got really excited. Also in case you're wondering: since obviously there is no such thing as a crate engine AMC V4 my plan was to simply reverse engineeer an existing engine into CAD, then completely recreate it using 5 axis CNC with billet aluminum and 3D printing from other sintered metals.